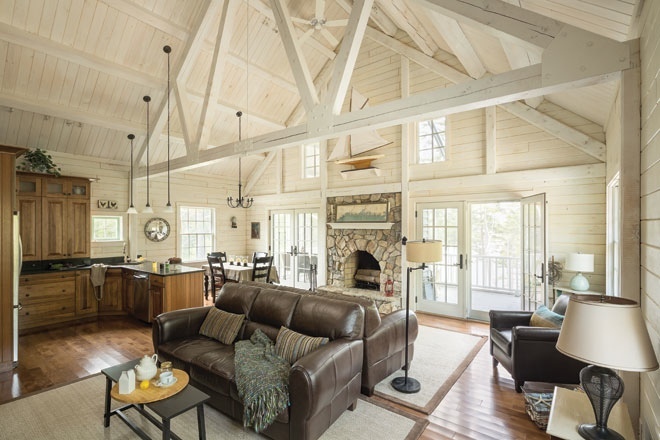 The gable roof truss above the screened porch references the gable roof truss at the front entrance and the exposed trusses of the great room. The roof has a purlin structure, which means the beams run horizontally along the length of the roof, instead of up and down the roof, as rafters do. The tail ends of the purlins can be seen on the underside of the higher and lower roofs here. 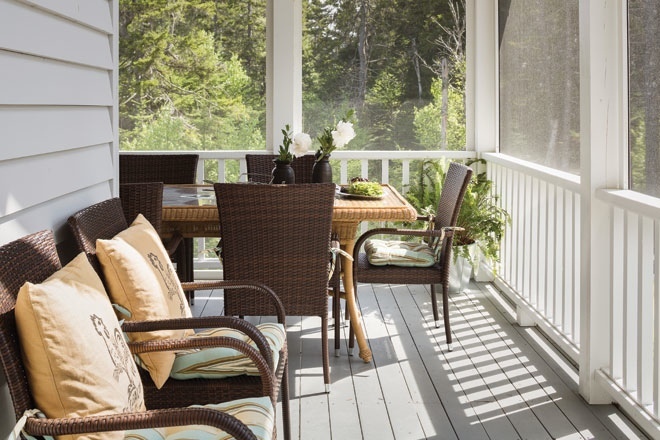 The screened porch forms a U-shape around the interior chimney. The table is from Restoration Hardware. French flour-bag pillows are from Nicola’s Home, and the seat-bottom cushions were made by a friend of the homeowners. The whitewash in the great room extends throughout the house, including a bedroom. 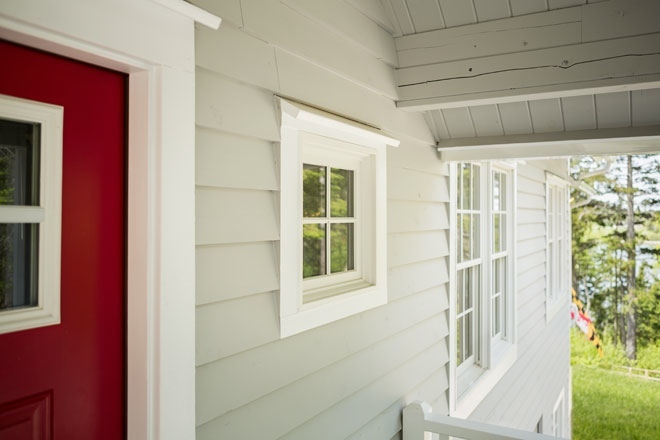 Although Lynn and Mark Rosenthal wanted whitewashed walls, when Lynn first saw the home’s interior, she thought it looked too white, so she selectively added color, as with the front door, which is red on one side, green on the other. Lynn painted the unfinished bench at the right. The bed in the master bedroom comes from the Rosenthals’ previous home. With a new mattress and box spring, it is so high that Lynn uses a step stool to get into it. The linens are from Ralph Lauren. A friend made the pillow shams and curtains. The antique night table was bought many years ago. The onion lamp is from Country Curtains. 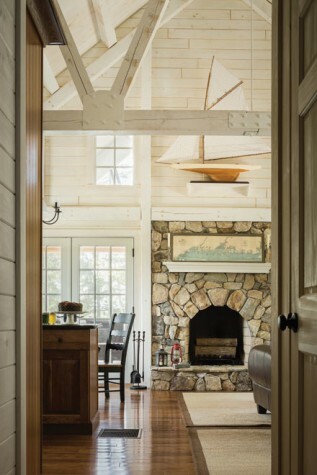 Builder Bruce Willette and mason James Ackley Jr. of J & C Masonry initially laid the fireplace stones on the floor, took a picture, and sent it to the homeowners, Lynn and Mark Rosenthal, so they could approve the design from afar. The sailboat looked too big and low when first placed on the mantle, so the Rosenthals’ son-in-law built a shelf above the fireplace. A Maine coast fishing map from Simply Home sits on the mantle below it. The dining room features a natural linen spread by South Street Linen and a chandelier from Lowe’s. The interior of the great room is finished with whitewashed tongue and groove boards, which line up with the exterior logs, so you can’t tell that there is a thick layer of insulation between the two. The Rosenthals’ daughters didn’t want a home that was two “woodsy” looking, so the family opted for a more modern look with logs that have been squared off and whitewashed. The steel plates that join the beams contribute to the more contemporary aesthetic. The lips over windows and doors offer some protection from snow and rain. The home looks like it is shingled, but it is actually made of northern white cedar logs. Say “cedar log cabin” and the first thing that pops into my mind is Smokey the Bear, standing by his forest domicile. In my imagination, it’s a Lincoln Log-type home with a cave-like interior, perfect for a creature who might want a pot of honey. I suppose I’m getting my bears confused here. The point? For me, “log cabin” equals “dark place in the woods.” So it’s quite a surprise to be sent to Mark and Lynn Rosenthals’ cedar log cabin in Roque Bluffs and find a bright cottage on a rocky bluff over Englishman Bay. Turns out, my imagination is dated. 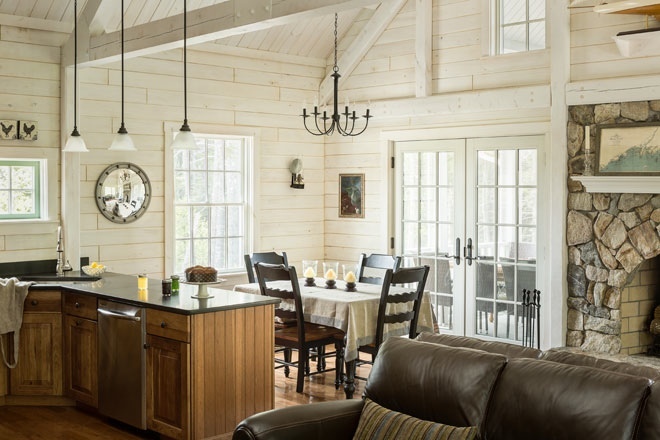 Cedar log homes—at least the ones constructed by Katahdin Cedar Log Homes, the largest producer in the country—are rustic, built of stacked Northern white cedar logs on the exterior and cedar beams and posts on the interior. But they aren’t exactly bear-friendly. They often have substantial great rooms with cathedral ceilings and exposed trusses and beams, not to mention handsome stone fireplaces. (Sorry, Smokey.) They are structurally sound, fully customizable, and energy-efficient, the latter virtue thanks to insulation that can be continuously laid against the thick exterior walls, as the home has no studs. Beachy? 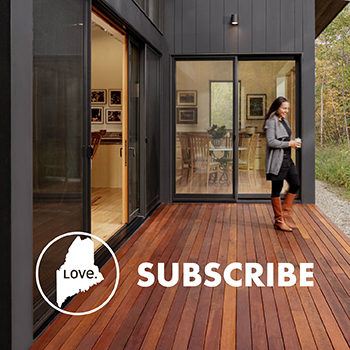 That’s not a word you’ll find in Katahdin Cedar Log Homes’s marketing material. But as Gabe Gordon, grandson of the founder of Katahdin Cedar Log Homes, says, building the Rosenthals’ home gave Katahdin a different idea of what they might be able to accomplish. Indeed, it made Gordon found a sister company—Arborwall—to offer contemporary houses like the Rosenthals’ to other customers. Now Gordon wears two hats, as the director of marketing for Katahdin Cedar Log Homes and the managing director for Arborwall. 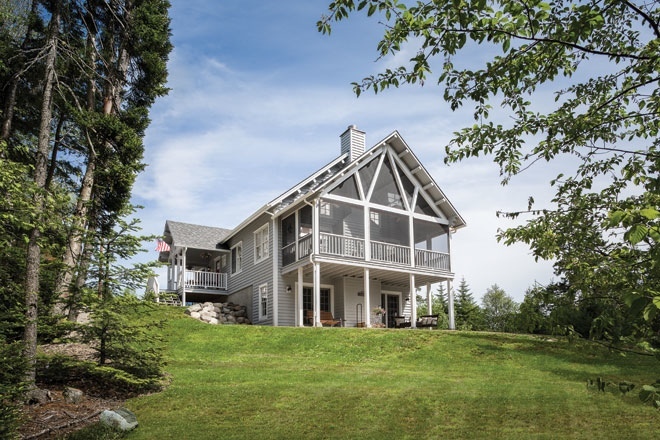 Mark and Lynn Rosenthal live in Baltimore, and although they had long wanted to build in Maine, they knew construction from afar would be challenging. To make the process more manageable, they considered kit homes. 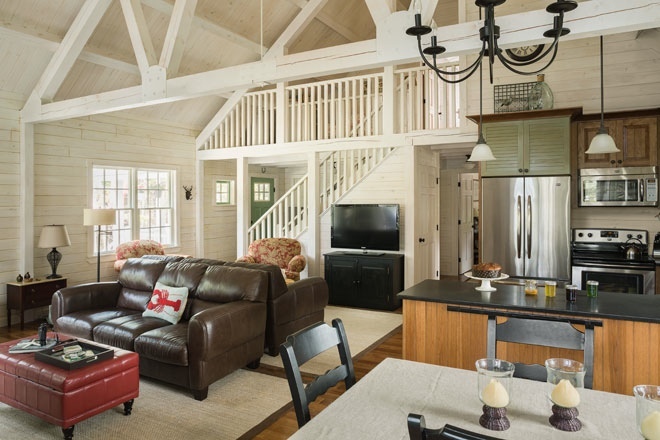 Log homes seemed more upscale than the other options they researched, and Katahdin’s approach to the environment pleased them. Katahdin only harvests trees from sustainably managed forests that are within a 100-mile radius of their manufacturing facility in Oakfield, and they use every part of the trees they harvest. Even the sawdust and scraps have a purpose; they feed the biomass boiler that heats Katahdin’s mills. Cedar is a naturally regenerating species, meaning it doesn’t need to be replanted. Indeed, in the Northeast it grows faster than it is being used. The Rosenthals’ daughters are “not really woodsy girls,” says Lynn, and they didn’t want rounded brown logs or a heavy, “male” atmosphere in the family’s new summer place. Lynn gravitated to a more modern look. 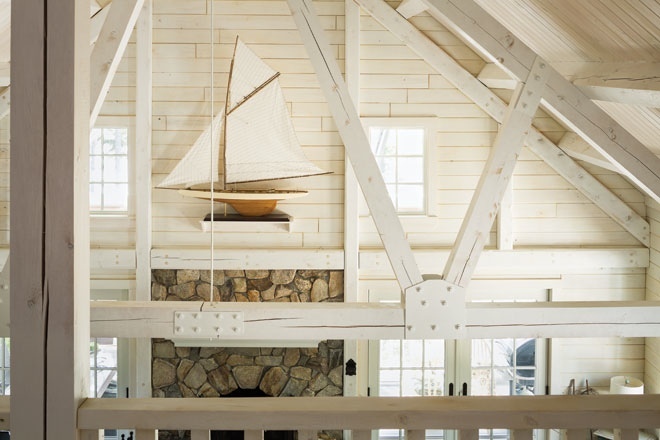 At her request, the interior beams and posts were squared off and joined (in the case of the trusses) with steel plates painted white. 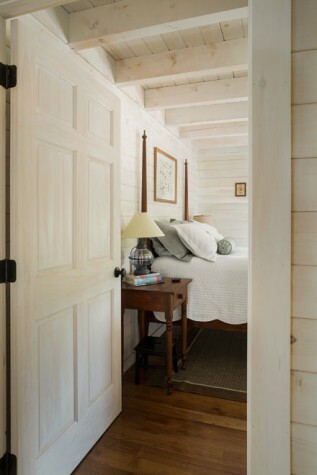 The cedar tongue and groove boards that comprise the interior walls were whitewashed. 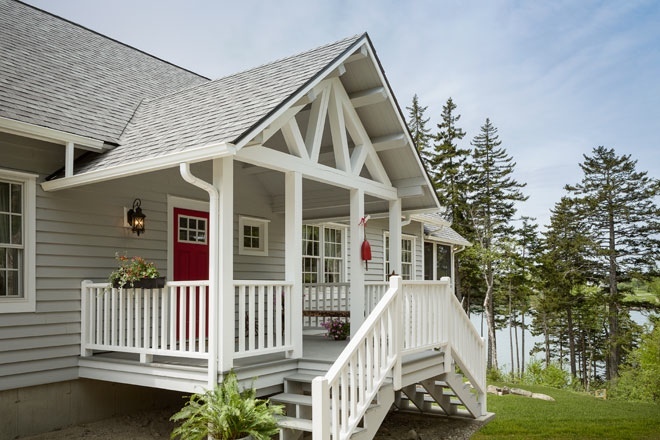 Meanwhile, the exterior was constructed of the usual solid cedar logs, but those logs were customized to look like clapboard, and they didn’t have the interlocking overhanging corners you would typically see on a typical log house. 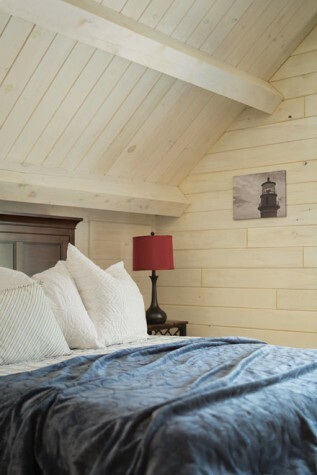 The practice of Katahdin Cedar Log Homes, and now Arborwall, is to provide all the structural material for a home—they deliver pre-manufactured kits to the job site—but the builder does the rest. In the case of the Rosenthals’ home, that builder was Bruce Willette of Island Falls. The Rosenthal home represented a particular challenge, he says, because of how much needed to be planned ahead of time. Take the lighting. Because of the unique roof design—particular to this home—he couldn’t just drill a hole in the ceiling where he wanted a fixture. That would ruin the roof’s insulation value. The Rosenthal roof was constructed of a skeleton of beams and purlins. (Purlins are beams that run lengthwise across the roof, instead of up and down the triangle of the gable, as rafters do.) Willette laid roof board atop the skeleton then added rigid insulation, roof sheathing, and architectural shingle, a heavier grade of shingle that gives the roof a layered look. All this needed to be coordinated with an electrician, because once the roof was completed, wires couldn’t be added. 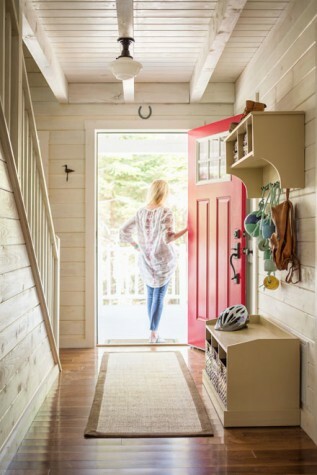 Katahdin’s design process (led by in-house planning specialist Shannon Hersey) allows for customization, but many of the other decisions—like the details of the kitchen and three full bathrooms—were made by the builder and homeowners. Willette designed two sets of stairs to the front porch, in order to suit the grade of the property. With the mason, he also designed the fireplace, first arranging the stones on the floor and taking a picture from above, so the Rosenthals could approve the result from afar. 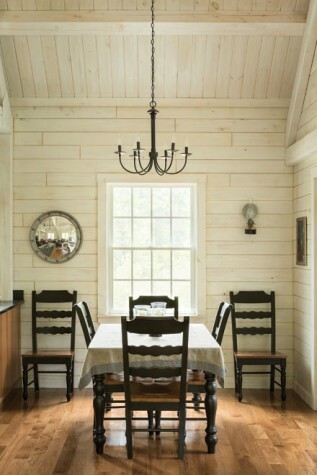 Although Lynn opted to whitewash most of the interior walls, she thought there needed to be some natural wood for “integrity.” The kitchen cabinets are largely dark wood and the floor is a pre-finished hickory. 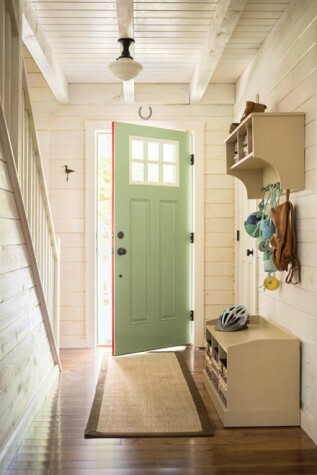 Even so, Lynn found things were “too white” when she first saw the interior, so she selectively added color, as with the sea green on the backside of the entryway door, and the red on the front. Lynn promised Mark that she wouldn’t spend too much money furnishing the house, so the interior combines budget-friendly new pieces with lamps, tables, and chairs that the Rosenthals had been storing in their basement. A bed frame that was no longer being used in Baltimore was brought to Maine. (When a new mattress and bedspring arrived in Roque Bluffs, they proved unusually thick, so now Lynn uses a stepstool to get into bed.) One of the Rosenthals’ daughters had two flowered chairs that were too big for her purposes, so they were added to the great room. Sisal rugs, hanging kitchen lights, and a dining area chandelier are from Lowe’s. KraftMaid cabinetry is from Just Cabinets Furniture and More. The hall has an unfinished bench that Lynn painted a mushroom color. One of the biggest purchases ended up being free, since the two leather sofas, which are placed back-to-back in the center of the great room, became mixed up with a theft. After some sleuthing, the Rosenthals discovered that the employee who sold them the sofas had used their credit card number to purchase things for himself. The store, in apology, never charged the Rosenthals for the furniture. In the end, the coastal look suited not only the Rosenthals’ design tastes, but also their practical needs. “We can hang snow shoes in there,” says Lynn. “But we spend most of our summers there, not our winters.” Now, on summer days, they can go down to the bay, walk in the nearby state park, or just sit and watch the moose who come to drink at the freshwater spring. Mark even saw—at least once, early in the construction—not a bear, but a bear print. Otherwise, all things ursine are far from their design sensibilities … and their door. M.F. Anderson & Sons Electric Inc.
Dennis J. King Masonry, Inc.